The construction of the world's largest solar power plant is underway in central India. When the 750-megawatt site starts operating in August, 2016, the project is set to overtake America's 550-megawatt ‘Desert Sunlight’ in California. The world's largest solar power plant that will be generating 750MW of electricity had been recently commissioned in Rewa district of the Indian state of Madhya Pradesh, the Times of India reported on Monday. Now, the 40-billion-rupee ($643 million) project is close to acquisition of 1,500 hectares of land, and by April government agencies are believed to start inviting tenders from developers. It is a joint venture of state-run PSU Urja Vikas Nigam with Solar Energy Corporation of India, and at least 20 percent of the energy generated by the plant will be used within the Madhya Pradesh state. “We are planning to inaugurate the plant on August 15, 2016. The plant will be developed in three segments of 250 MW each. Land acquisition will be over by end of month and over 90 percent land for the project is owned by government,” additional chief secretary for new and renewable energy, SR Mohanty told the Times of India. As the country embraces clean energy, India plans 25 solar parks and several major solar power projects in the states of Rajasthan, Gujarat, and Jammu and Kashmir. But the production of the Madhya Pradesh project is going to cost less than any other, at an estimated 5 rupees (US8 cents) per unit. 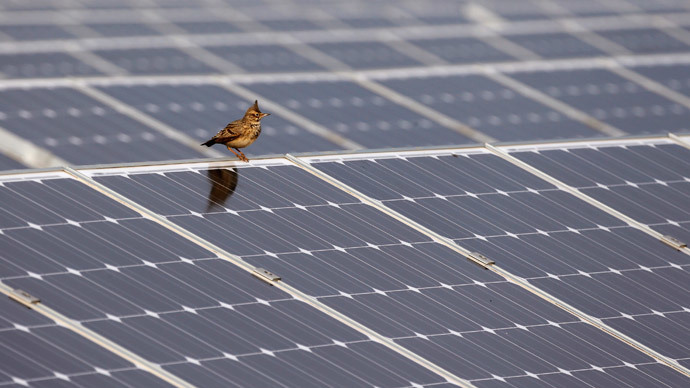 By 2022, India plans to install 100GW capacity of solar power. China aims to achieve the same goal by 2020. "We have always spoken of energy in terms of megawatt. It is the first time we're talking of gigawatt. We have no option but to make a quantum leap in energy production and connectivity," Prime Minister Narendra Modi said, addressing a global conference, RE-Invest 2015, on Sunday. However, in spite of all the advantages of solar power use in the rural India, there are some critics due to low availability of land.